Wikipedia | A.I. : Artificial Intelligence is a 2001 Academy Award nominated science fiction film directed, co-produced and co-written by Steven Spielberg. Based on Brian Aldiss‘ short story “Super-Toys Last All Summer Long“, the film stars Haley Joel Osment, Frances O’Connor, Jude Law, Sam Robards, Jake Thomas and William Hurt. Set sometime in the future, A.I. tells the story of David, a child-like android programmed with the unique ability to love. Development of A.I. originally began with Stanley Kubrick in the early 1970s but the film languished for years because Kubrick felt computer-generated imagery was not advanced enough to create the David character, whom he believed no child actor would believably portray. In 1995 Kubrick handed A.I. to Steven Spielberg, but the film did not gain momentum until Kubrick’s death in 1999. Spielberg remained close to the original film treatment for the screenplay, and replicated Kubrick’s secretive style of filmmaking. This film was dedicated to Kubrick’s memory. In the film, Global warming has led to ecological disasters all over the world and a drastic reduction in natural resources, including humanity itself. Humanity’s best efforts to maintain civilization have led to the creation of new robots known as mechas, advanced humanoid robots capable of emulating thoughts and emotions. David (Haley Joel Osment), an advanced prototype model created by Cybertronics, is designed to resemble a human child and to virtually feel love for its human owners. They test their creation on one of their employees, Henry Swinton (Sam Robards) and his wife Monica (Frances O’Connor). The Swintons have a son, Martin, who has been placed in suspended animation until a cure can be found for his rare disease. Although Monica is initially frightened of David, she eventually warms to him after activating his imprinting protocol, which irreversibly causes David to feel love for her as a child loves a parent. As he continues to live with the Swintons, David is befriended by Teddy, a wise, robotic teddy bear who takes upon himself the responsibility of David’s well being. Martin is suddenly cured and brought home; a sibling rivalry ensues between Martin and David. Martin’s cruel and scheming behavior backfires when he and his friends activate David’s self-protection programming at a pool party; David gets frightened and clings to Martin, inadvertently pulling him into the pool. Alarmed, Henry decides to destroy David at the factory where he was built, but Monica instead leaves him (alongside Teddy) in a forest to live as unregistered mechas. David is captured for an anti-mecha Flesh Fair, an event where obsolete or damaged mechas are destroyed before cheering crowds. David is nearly destroyed, but the crowd is swayed by David’s pleas for mercy, and he escapes along with Gigolo Joe (Jude Law), a male prostitute mecha who is on the run after being framed for murder by the husband of one of his clients. The two set out to find the Blue Fairy, whom David remembers from the story The Adventures of Pinocchio. As in the story, he believes that she will transform him into a real boy, so Monica will love him and take him back. Joe and David make their way to the decadent metropolis of Rouge City. Information from a holographic volumetric display answer engine called “Dr. Know” (voiced by Robin Williams) eventually leads them to the top of the Rockefeller Center in the flooded ruins of New York City, using a submersible vehicle they have stolen from the authorities, still hot on Joe’s tail. 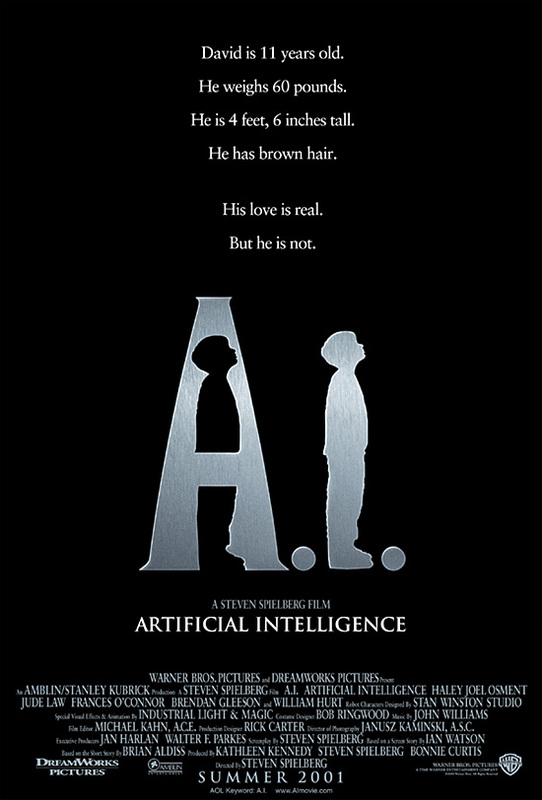 When they arrive at New York, David’s creator Professor Hobby (William Hurt) enters, after David destroys an android that looks exactly like him, and excitedly tells David that finding him was a test, which has demonstrated the reality of his love and desire, something no other robot could do until now. In Professor Hobby’s office, David finds a room full of Davids and Darlenes (David’s female counter-parts), packaged and ready to sell to anyone looking for “A love of their own.” A disheartened David attempts to commit suicide by falling from a ledge into the ocean, but Joe rescues him. A little while later, Joe is captured by the authorities, but David escapes. David and Teddy take the submersible to the fairy, which turns out to be a statue from a submerged attraction at Coney Island. Teddy and David are trapped when the Wonder Wheel falls on their vehicle. Believing the Blue Fairy to be real, he asks to be turned into a real boy, repeating his wish without end, until the ocean freezes. The film switches to the 5th millennium. Humanity has become extinct and Manhattan is buried under several hundred feet of glacial ice. Earth is now being excavated and studied by the descendants of the mechas, now silicon-based supermechas possessing some form of telekinesis and telepathy. They find David and Teddy, the only two functional mechas who knew living humans. David wakes up, finds the frozen stiff Blue Fairy, and tries to touch her. However, because of the time passed and the damage to the statue, it cracks and collapses immediately. David realizes that the fairy was fake. Using David’s memories, the supermechas reconstruct the Swinton home, and explain to him that he cannot become human. However, they create a clone of Monica from a lock of her hair which has been faithfully saved by Teddy, and restore her memories from the space-time continum. However, one of the supermechas (voiced by Ben Kingsley) explains that she will live for only one day and that the process cannot be repeated. David spends the happiest day of his life playing with Monica and Teddy. The ephemeral Monica tells David that she loves him as she drifts slowly away from the world. This was the “everlasting moment” David had been looking for; he closes his eyes, and goes “to that place where dreams are born”.